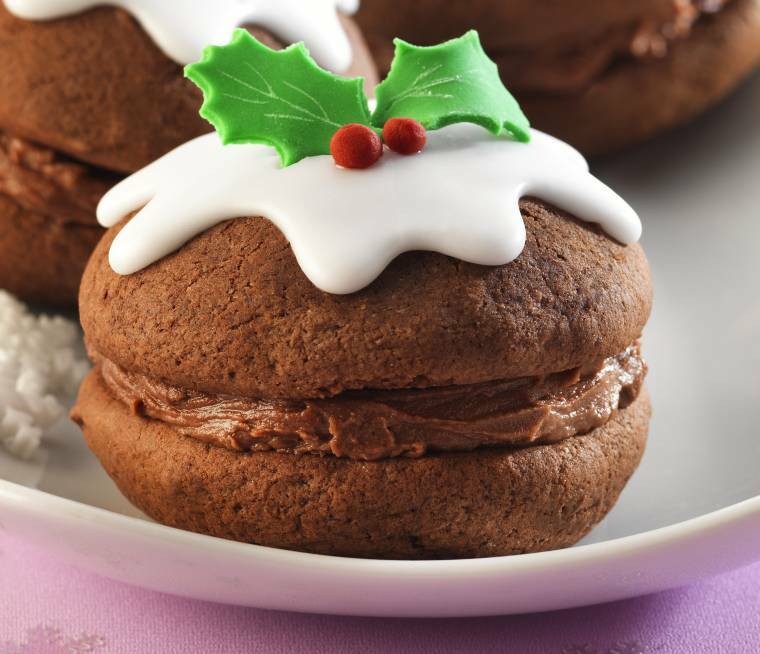 Christmas Pudding Whoopie Pies anyone? Preheat oven to 180°C (160°C fan oven, 350°F, Gas 4). Line 3 large baking trays with baking parchment. In a mixing bowl, cream the butter or margarine and sugar together until pale and creamy then beat in the egg. Sift the flour, cocoa and Bicarbonate of Soda into another bowl. Gradually add spoonfuls of the flour mixture to the creamed mixture, stirring well after each addition, along with sufficient buttermilk to make a smooth, thick cake mixture. Note: you may not require the full 250ml (9fl.oz) buttermilk. Using a 5cm (2in) diameter ice cream scoop, drop 6 scoops of the mixture on to each baking tray, spaced well apart to allow for room for spreading. Bake in the oven for 12-14 minutes until risen, lightly golden and firm to the touch. Cool for 5 minutes on the trays before transferring to a wire rack to cool completely. Lightly dust the work surface with icing sugar and roll out the green Regal-Ice Icing thinly. Using a small holly leaf cutter, stamp out 32 leaves and set aside to firm up. Break off tiny pieces of red Regal-Ice Icing and roll to make small holly berries. Spread Fairy Cake Icing over the peaked side of half the cold pies, smoothing the icing with the back of a knife to resemble custard, and decorate each with a couple of holly leaves and berries. Put the butter in a mixing bowl and beat until soft. Gradually sieve in the icing sugar and cocoa, beating well after each addition, to make a smooth, spreadable icing. Spread thickly over the flat sides of the remaining pie halves using a knife. When the iced pie tops have set, carefully sandwich them on to the filled pie halves. For added festive flavour, add 7.5ml (1 1/2tsp) ground cinnamon, mixed spice or finely grated orange zest to the chocolate whoopie mixture prior to baking. 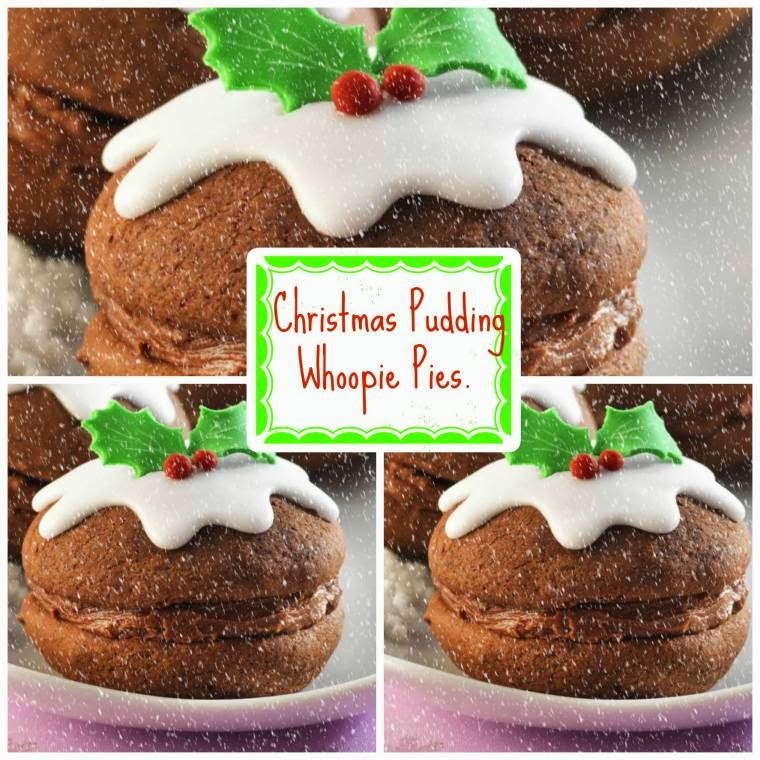 Fancy making some Christmas Pudding Whoopie Pies? You Might Also Like these Christmas Recipes: All Things Christmas. Ah wow they are so cute! I've not tried to make whoopie pies yet! Just my kind of cake ! ! !